Virtual Contact CenterA contact center that enables agents to be located in different geographical locations yet managed as if they were located in the same physical location. directs emails to agents via an email queue. Agents must be in Available state to receive these incoming emails. When an incoming email is offered to an agent, the Email tab blinks indicating an incoming request. The agent can accept or reject the request. On accepting, the agent's status changes to Busy. On rejecting the email, the agent's status changes to Working Offline. Note: You can view or edit your queue assignments in the AgentAgents use the Agent Console to view and manage customer interactions. Virtual Contact Center supports Regular agents and Supervisor agents. Profile. For details, refer to Viewing Queue Assignments. Accept one email at a time. Note: Pulling emails is a privilege given by the administrator in Configuration Manager. Pulling emails from a queue gives you the flexibility to quickly look at the sender or the subject of the email, and then accept an email that requires the most immediate attention. 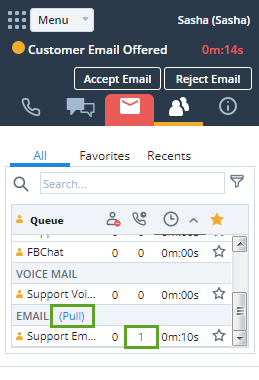 The Transaction tab in the Control Panel lists your email queues and indicates the number of emails pending in a queue. Navigate to the Transaction tab in the Control Panel. Click the Pull link or the number of emails. The Agent ConsoleVirtual Contact Center's browser-based graphical user interface (GUI) used by Agents to manage customer interactions. pulls all emails from the queue and presents the list in the CRM Panel. Note: You can identify unwanted emails, select, and delete them as well. To delete emails, see Deleting Emails From a Queue. Check the sender and/or subject of the email, and click the Subject link of an email you wish to open. The email is offered to you instantly. The email tab blinks red. The work flow is the same as accepting an email. If the email is from an existing customer, a relevant case or customer record pops for preview as well. Note: If you have multiple emails opened in tabs, the screen pop tab, presenting the case number and customer name, helps you navigate better. Your status changes to busy. The email creates a case and opens in a new tab. Your status changes to post processing and then back to Available. The email saves as a case in Open state and is assigned to you. You can edit case details, reply, or create a new follow-up. To edit, click the Edit link. In the edit mode, you can change case details such as the status, priority, severity, subject, and more. 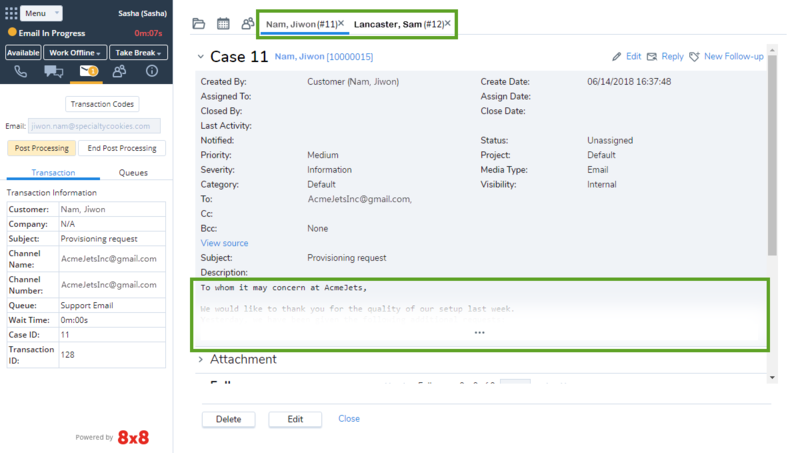 Select Notify option to notify case details to another colleague or back to the customer. For more details on editing case records, See "Creating and Editing Case Records"
To reply, click the Reply link. In the reply mode, you can respond to the customer email, insert case details, attachments, or content from FAQ knowledge base. The case information (original email) is attached automatically in the reply mode. To create a new follow-up, click the New follow-up link. You can create a new follow-up, respond to the customer email, insert case details, attachments, or content from FAQ knowledge base. The follow-up record does not include the original email. The Email tab in the Control Panel blinks red indicating an incoming email. If the incoming email is from an existing customer, the customer record pops for preview. Preview the customer or case data and click Accept Email. Your status changes to busy. The email creates a new case or follow-up record and opens in a new tab. The screen pop tab that presents the email, displays the case ID and customer name. If you have multiple emails opened in tabs, it helps you navigate better. The email saves as a case or follow-up in Open state and is assigned to you.